* Easy and fun to use, natural color, waterproof, reusable and non-toxic. * Activa's Model N' Mold enables you to not only build a Sand Castle, but also add a moat that holds water. * Create exciting landscapes and topographical maps that can be painted, include rivers and lakes that hold water and survive being studied and reformed. * Perfect for fast dimensional studies or as an introductory carving material. * Quickly and easily, produce molds for sand casting. 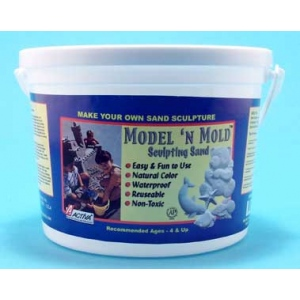 * Mold N' Mold is special sand designed for creative use indoors or out, and is perfect for all ages.